Iran’s nuclear talks in Geneva: Is a historic breakthrough possible? It’s hard to believe, but the U.S. and Iranian nuclear talks may be close to a historic breakthrough. 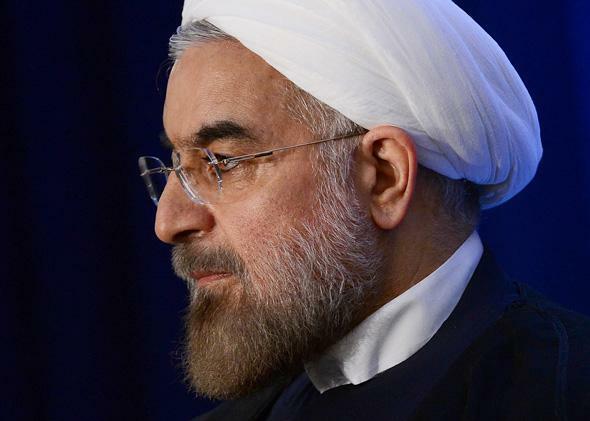 Iran’s President Hassan Rouhani in New York on Sept. 26, 2013. Readers glancing away from the debt ceiling showdown may have noticed the hopeful headlines on some other unlikely negotiations in Geneva over the fate of Iran’s nuclear program. Two points are missing from most of the stories about these talks. First, the chances for a truly historic breakthrough are pretty good—which, at this stage in talks of such magnitude, is astonishing. Second, the Iranians’ main demands—at least what we know of them—are pretty reasonable. Toward the end of Iranian President Hassan Rouhani’s ground-shaking trip to New York last month, it was announced that his foreign minister, Mohammad Javad Zarif, would meet Tuesday and Wednesday in Geneva with delegates from the P5+1 states—the five nuclear powers (the United States, Russia, China, France, and Britain) plus Germany—with the goal of finishing an accord within a year. Many saw this timetable as way too ambitious, and given how talks of this sort typically proceed, it was. But these talks—the first round anyway—turned out to be far from typical. Rather than recite boilerplate principles and opening gambits, Zarif presented an hourlong PowerPoint briefing—in English, so there would be no misunderstandings—laying out a path for negotiations and a description of a possible settlement, replete with technical detail. Not only that, but after the first day of meetings, the U.S. and Iranian delegations broke away for an hourlong bilateral session, which American officials described as “useful” in clearing up ambiguities. After the second day, another meeting was set for Nov. 7–8. Some said it would be at the “ministerial” level, which, if true, would mean Secretary of State John Kerry would head the American delegation. A U.S. secretary of state doesn’t usually become so visibly involved until much closer to the end of a negotiation, suggesting that maybe we’re closer to the end than anyone could have imagined. This is remarkably fast work for any set of nations negotiating any issue—much less for nations that haven’t had diplomatic relations in 34 years, and on an issue that ranks among the globe’s most perilous and contentious. Now for some caveats. The biggest one is that we don’t yet know the full substance of Zarif’s hourlong PowerPoint presentation. The Iranians went into the talks, requesting that they be kept secret until they were finished—and so far very little has leaked out, beyond a statement issued by Iran’s official press agency (the substance of which has been confirmed by Western reporters on the scene in Geneva). However, it can be said that the Iranians’ chief demand—that any accord must allow them to continue enriching uranium, at least to some degree—is perfectly valid. Officials and pundits who say otherwise are, at best, disingenuous. The basis for the past several years of pressure on Iran to give up its apparent quest for nuclear weapons—the legal and diplomatic foundation for the U.N. resolutions and U.S.-backed sanctions—is the Nuclear Non-Proliferation Treaty. The NPT, which has been signed by 189 nations (including Iran), is a grand bargain between the five big nuclear powers and the rest of the world. Basically, the other signatories to the treaty have pledged not to develop nuclear weapons. However, in exchange, they are permitted to develop—in fact, the Big Five promise to help them develop—nuclear technology for peaceful purposes. So, when the Iranians insist on their “right” to enrich uranium for peaceful nuclear energy, they aren’t asserting some self-contrived privilege; they are quoting the NPT. This provision of the NPT does contain a loophole, a potentially fatal flaw. Under its terms, a nation can enrich uranium for months or years, all the while claiming that it’s for peaceful purposes and thus legally permitted—until one day, all of a sudden, its scientists have enriched enough uranium, to a level of enough purity, to build a nuclear bomb. The nation’s leader would then announce that the nation is abrogating the treaty (permissible with three months notice under Article 10) when it’s too late for the “international community” to stop it. This is the main (and valid) concern that many skeptics of Rouhani-mania have about the current talks with Iran. The Iranians have been enriching uranium for many years. In some of their facilities, they’ve enriched it to a purity of nearly 20 percent. About 80 percent purity is needed for “bomb-grade” uranium, but it takes little time or effort to go from 20 to 80 percent—much less than it takes to go from, say, 5 to 20 percent. Iran’s main goal in these talks is to get Western nations to lift their economic sanctions, which have had a crippling effect. The sanctions have been imposed as leverage to get Iran to give up its apparent drive to build a nuclear weapon. The deal that’s envisioned: the Iranians cut back on their nuclear program in exchange for the West cutting and eventually lifting its sanctions. But the critics lay out this nightmare scenario: Iran cuts its enrichment levels back to 3 or 5 percent; the West lifts its sanctions; but then, suddenly one day, Iran goes back to enriching at much higher levels, giving them a “break-out capability” to build a nuclear bomb—and it’s too late for the West to reimpose the sanctions, which had taken so many years to have an effect. However, Yadlin argues that for such an agreement to be “reasonable,” Iran would also have to make drastic cutbacks in its stockpile of centrifuges (which spin uranium isotopes as part of the enrichment process) and to close, or render dysfunctional, at least two of their nuclear reactors. Were these precautionary steps, or something like them, included in Zarif’s PowerPoint presentation? Would they be acceptable to Rouhani—and, more importantly, to Iranian Supreme Leader Ayatollah Khamenei, who is the true decider in such matters? There is also the issue of key players. Some of the sanctions were imposed and can be lifted by President Obama; others would require congressional action. Some in Congress want nothing less than regime-change in Iran, and they fear that a nuclear treaty—even, or especially, a successful one—would go a long way toward legitimizing the current regime. They would rather keep sanctions in place, under the notion—almost certainly misplaced—that this is the best way to destabilize the regime. In other words, even assuming good intentions on all sides, negotiating and enforcing a treaty of this sort is a complex business. It’s why many, even those in favor of a treaty, doubted the accord could be worked out as quickly as Rouhani publicly hoped. It’s also probably why he and Zarif are off to such a quick start. The details are what usually take years to iron out. If they can nail down the goals and the path to get there in a matter of days, maybe the rest can be settled in merely many months.